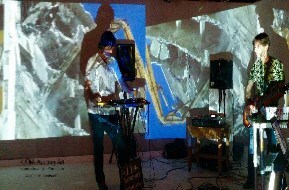 Its primal energy has often been in direct superposition with more sophisticated forms of sound production such as cutting edge real-time recording and looping and the use of current and vintage electronics.An all embracing approach based on the concept of improvisation took the project through a path of collaboration with the visual art scene. Following its performance in December 2011 at Miami Independent Thinkers, -UOM- is honored with the Miami New Times Mastermind 2012 Honorable Mention. From its origins in 2007 -UOM- keeps evolving, always looking to open new avenues of expression through the development of music, offering a valuable sonic alternative, at the same time challenging what already has been heard.